Add to My Favorite Store. 20x-40x-80x Binocular Stereo Microscope Dual LED Lights. Dual LED illuminators --- low heat, 100,000 hr life time. 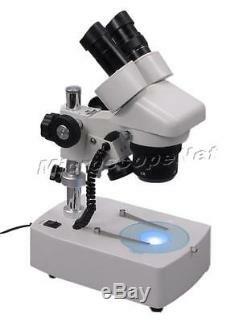 This is a premium quality dual LED light stereo microscope with 20x, 40x, 80x maginifications. It is built by top quality glass and metal. This binocualr stereo microscope provides you with both long working distance and crystal clear images. The wide filed eyepieces with rubber eyeshields will bring you not only large field of view, but also comfort for continous operating. The dual illumination system will allow you to use both bottom transmitted lighting eg. For diamond, slides and top incident lighting eg. For circuit boards, coins, stamps. These bright LED lights will last for over 100,000 hours. This microscope is widely used by many jewelry dealers, gemologists, and collectors. Plug and see, no special knowledge needed. High quality optical glass elements. Three magnification levels: 20x, 40x & 80x. Dual LED lights (upper and lower). LED light lifetime: 100,000 hours. Sharp stereo erect images over a wide field view. Diopter adjustment on left ocular-tube. Tool-free focus knob tension adjustment. Product GS and CE approved. Eyepieces: wide field WF10X/20 & WF20X. Objectives: rotational 2x & 4x. Left ocular-tube diopter adjustment ±5dp. Interpupillary distance: 2-3/16" 2-15/16"(55-75mm). Working distance with optional 0.5x attachable objective: 4-3/4 (120mm). Easy illumination mode switch: [upper only] [off] [lower only]. Frosted glass stage plate: 3-3/4 (95mm) in diameter. White/black plastic stage plate: 3-3/4 (95mm) in diameter. Power supply: 110V/60Hz (US and Canada). Dimension: 9-7/16" x 5-7/8"x14-1/8 (24cmx15cmx36cm). Net weight: 8lb (3.6kg). Binocular stereo microscope with WF10X/20 eyepieces. A pair of WF20X eyepieces. Power adapter Input 110V, 50/60Hz, output 5V/300mA. Fluorescent ring light --- get brighter illumination. Gooseneck fiber cold light --- get focused strong light. Gem jewel tweezer --- hold jewel, rock, plant. Darkfield stage --- get even, indirect light from side. USB camera eyepiece --- take live color photos from computer. Boom stand --- get large free operation room. 0.5X auxiliary objective lens - get larger fieldview and working distance. Mechanical specimen stage - easy to move your specimen. A: We are happy to leave feedback for our customers once we have been paid and the item has been delivered to the carrier. We are here to exceed your expectations! The item "20-40-80x Binocular Stereo Microscope LED + 48mm Thread" is in sale since Monday, August 08, 2016. This item is in the category "Business & Industrial\Healthcare, Lab & Life Science\Lab Equipment\Microscopes". The seller is "bh542" and is located in Northeast. This item can be shipped to United States, Canada, United Kingdom, Denmark, Romania, Slovakia, Bulgaria, Czech republic, Finland, Hungary, Latvia, Lithuania, Malta, Estonia, Australia, Greece, Portugal, Cyprus, Slovenia, Japan, China, Sweden, South Korea, Indonesia, Taiwan, South africa, Thailand, Belgium, France, Hong Kong, Ireland, Netherlands, Poland, Spain, Italy, Germany, Austria, Israel, New Zealand, Singapore, Switzerland, Norway, Saudi arabia, Ukraine, United arab emirates, Qatar, Kuwait, Bahrain, Croatia, Malaysia, Chile, Colombia, Costa rica, Panama, Trinidad and tobago, Guatemala, Honduras, Jamaica, Philippines.